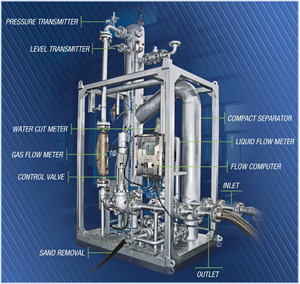 The Wet-Gas MPFM is a GLCC© separator-based MPFM that provides high reliability and accuracy with low uncertainty. By pre-conditioning gas from liquid, the two single-phase streams are measured independently, resulting in higher accuracy than single multiphase stream measurement without flow conditioning. Capable of handling perturbation without affecting measurement performance. The Wet-Gas MPFM has no radioactive source making it safer and cheaper to operate, requiring less safety permits. It is a skid-mounted plug-and-play system that requires minimal downtime to install, minimizing production loss. *These specifications are only an example. Since our products are custom designed based on your unique specifications the operating ranges will also be unique to your field needs. *Operating range, handling capacity, sizing, and dimensions are customizable according to requirements.